Did you know that correctly starting up your system each season not only improves the performance of your system but leads to better watering efficiency, saved time, water and money? Below, we’ve provided an essential guide to a seasonal start-up of irrigation and sprinkler systems here in Omaha. All of these can be tricky without the help of a really-well written owner’s manual or professional assistance. If you’re uncertain about the process or prefer not to handle this annual chore alone, contact Above & Beyond CGM to lend a hand. Be sure to start by turning on your system’s main valve slowly, allowing the pipes to fill gradually with water. If done too rapidly, it can cause high pressure that leads to cracking or burst water lines. At the controller, activate each zone one at a time to verify proper operation. Systematically go through each station on the controller, checking for proper operation of the zone. The way this is achieved varies based on the controller installed. Refer to your operator’s manual or call Above & Beyond CGM at (402) 934-8866. We have experience with many controllers installed in the Omaha area and will be happy to help. Pay close attention to proper operating pressure (low pressure indicates a line break or missing sprinkler), proper rotation and adjustment of sprinkler heads, and adequate coverage. It may be necessary to check and unclog, adjust or replace heads if performance is lacking in any zone or head. 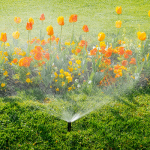 Once you are satisfied that the system is operating normally, with no leaks or ill-performing sprinkler heads, you can set up your weekly watering schedule and program the controller. Some controllers are battery operated and may need a replacement installed at this time. If you have a system weather sensor, you’ll want to uncover and clean it, as well. While many Omaha homeowners opt to handle seasonal sprinkler system start-ups themselves, it is essential to be sure to follow the above steps to prevent your pipes and components from being damaged in the process of turning things back on. We can provide expert guidance in getting your system up and running the right way and ensure your lawn and landscape thrives this season. Call us at (402) 934-8866.